Megacities, which can be roughly defined as cities with a population of over 10 million people are on the increase due to ongoing urbanization trends. The United Nations notes that since the 1970’s the number of megacities has more than tripled (from 8 to 34), and is expected to further double until 2050 (to exceed 60). The question we are wondering is how can GeoSocial analysis help understand such cities. To this end, we have recently had a paper published entitled: “Megacities: Through the Lens of Social Media” in the Journal of the Homeland Defense and Security Information Analysis Center (HDIAC). 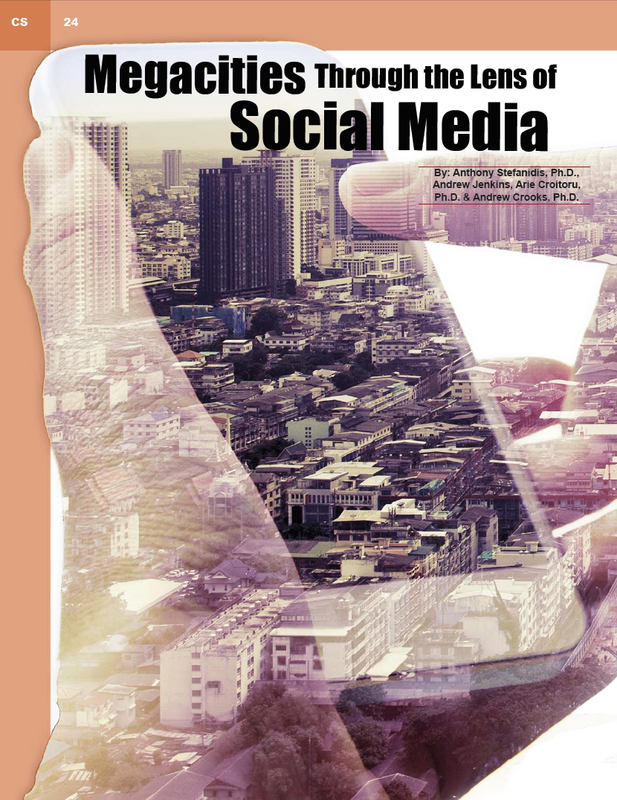 In the paper we discuss opportunities and challenges that social media brings with respect to understanding the physical and cyber spaces within megacities. Below you can see the synopsis to our paper. Due to ongoing urbanization trends the worldwide urban population is projected to grow from half of the global population (today) to two thirds of it by 2030. Almost all the new megacities that will emerge through this process are in geopolitical hotspots of southeast Asia and sub-Saharan Africa. Therefore, the U.S. Department of Defense must consider the challenges presented by engagement in such environments when planning for the future. The physical challenge of operating in such dense, highly three-dimensional, environments is only compounded by the added challenge presented by the advanced functional complexity of these environments: megacities function at the intersection of the physical, social, and cyber spaces. Accordingly, military operations in these locations must prepare to engage in environments where news, ideas, and opinions are shaped in cyberspace and propagated across the physical urban landscape. As social networks connect (or, often, divide) populations they form communities and facilitate their mobilization. We have observed these processes time and again, from the streets of Cairo during the Arab Spring, to the streets of Tokyo during the Fukushima nuclear disaster, and the streets of Paris during the recent ISIL terrorist attacks. 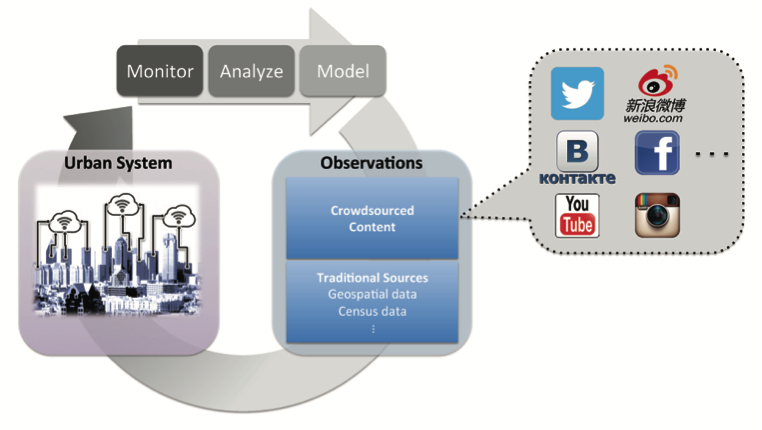 Advancing our capability to analyze crowd-generated content in the form of social media feeds is a substantial scientific challenge with considerable implications for future DoD operations. 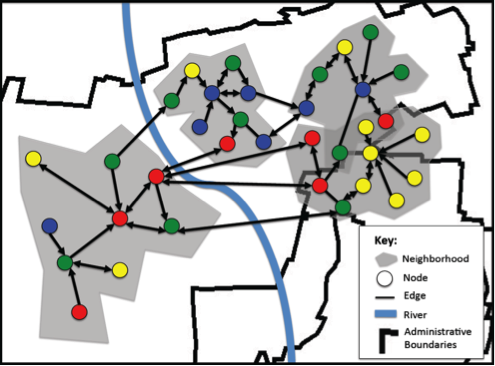 In this publication, we use representative examples to demonstrate the opportunities and challenges associated with such information, especially as they relate to large urban areas. An emerging framework to study urban systems. Social networks embedded within a geographical content, leading to connected, non-contiguous areas. The proliferation of social media has led to the emergence of a new type of geospatial information that defies the conventions of authoritative or volunteered geographic information, yet can be harvested to reveal unique and dynamic information about people and their activities.